We are informed by the current Vendors that the property benefits from mains water, mains electricity, private drainage, LPG fired central heating, UPVC double glazing, telephone subject to B.T. transfer regulations, Broadband available. Superbly located in rural surroundings, being accessed by a Council maintained roadway, having panoramic views over open countryside and towards the Llanllwni Mountains, being rurally located, yet only half a mile or so from the popular Teifi Valley Market Town of Llanybydder, with a good range of local facilities, including Primary School, Doctors Surgery, Chemist, Shops, Public Houses and Places of Worship, some 6 miles distant from the University and Market Town of Lampeter, offering a comprehensive range of shopping and schooling facilities, approximately 17 miles North of the County Town of Carmarthen, and within half an hour's drive of the Ceredigion Heritage Coastline with its many sandy beaches and secluded coves. Lee Villa provides potential Purchasers with an unique opportunity of acquiring a charming and deceptively spacious residential smallholding. The property itself has undergone recent refurbishment and extension and now provides spacious modern living with 3 double bedrooms and 2 bathrooms, whilst enjoying the benefit of LPG fired central heating and UPVC double glazing throughout. Externally lies the true beauty of this property, with an extensive manicured level lawned garden, an addition of a 3 acre paddock, all of which enjoys breathtaking and stunning views over the renowned Teifi Valley and Llanllwni Mountains. A superb location with stunning views but yet being within close proximity to local amenities. This property has seclusion and convenience. The spacious well appointed accommodation currently offers the following which provides potential for a further 4th bedroom on the first floor. Accessed via a half glazed UPVC entrance door, laminate flooring. 16' 5" x 15' 10" (5.00m x 4.83m) into bay. With stone open fireplace with a cast iron multi fuel stove inset, timber staircase to the First Floor accommodation, feature beamed ceiling, picture rail and shelving, radiator. 23' 3" x 11' 9" (7.09m x 3.58m). A stunning addition to the property, enjoying triple aspect windows, feature beamed ceiling, radiator, T.V. point, UPVC double glazed patio doors to the decking area, laminate flooring, side entrance door to the front parking area. 15' 2" x 12' 2" (4.62m x 3.71m). Into bay. A fitted Pine Kitchen with wall and floor units incorporating a ceramic 1 1/2 sink and drainer unit with chrome mixer tap, space and plumbing for dishwasher, Flavel cooker range (available by separate negotiation), fridge/freezer and dishwasher (also available by separate negotiation). 7' 3" x 7' 9" (2.21m x 2.36m). With plumbing and space for automatic washing machine and tumble dryer, stainless steel single drainer sink unit, radiator, strip lighting, UPVC half glazed stable door, laminate flooring. 7' 7" x 5' 6" (2.31m x 1.68m). With radiator, tongue and groove walling and ceiling, built-in cupboard. 8' 2" x 7' 9" (2.49m x 2.36m). Modern recently built with a 3 piece suite comprising of a double shower cubicle, low level flush w.c., pedestal wash hand basin, chrome heated towel rail, fully tiled walls, extractor fan, access to loft space. 12' 9" x 11' 3" (3.89m x 3.43m) into bay. With radiator, enjoying stunning views over the open countryside, Teifi Valley and Llanllwni Mountains beyond. 9' 2" x 5' 6" (2.79m x 1.68m). With a modern 3 piece suite comprising of a panelled bath with Mira shower over and shower screen, low level flush w.c., pedestal wash hand basin, part tiled walls, extractor fan, radiator. 12' 9" x 11' 2" (3.89m x 3.40m) into bay. With radiator, T.V. point, double aspect windows enhancing the view over the open countryside. 23' 7" x 18' 4" (7.19m x 5.59m). A large spacious bedroom enjoying stunning panoramic views over the open countryside with the possibility of dividing into two separate bedrooms, two radiators, walk-in wardrobe, airing cupboard with Baxi LPG central heating boiler. With low level flush w.c., pedestal wash hand basin. A particular feature of this charming property is its extensive garden area, being laid to level lawn, and located to either side of the property, the garden having post and rail fencing along the front, with a range of mature shrubbery and ornamental trees. To one side lies an established vegetable garden and raised bed area and a POLY TUNNEL measuring 15' x 10'. The garden has been lovingly maintained by the current Owners providing an extensive and attractive outdoor space for all to enjoy, if desired could be sectioned off to create a small paddock area. 28' 0" x 10' 0" (8.53m x 3.05m). A 6 berth static caravan consisting of 2 bedrooms, a shower room, kitchen and living area. This caravan is currently utilised as a successful holiday let business and overflow accommodation. PLEASE NOTE: Holiday let equipment available by separate negotiation. 37' 0" x 27' 0" (11.28m x 8.23m). Recently extended, with concrete flooring, water and electricity connected, fitted wall and floor units. With CLOAKROOM having low level flush w.c. and wash hand basin. 12' 0" x 10' 0" (3.66m x 3.05m). In all some 3 ACRES or thereabouts having access via a private track leading from the garden area. The land is gated, well fenced and benefits from sheltered areas, ideally suiting Animal grazing or for those seeking self sufficiency. The land itself provides an amazing vista point over the surrounding countryside. Truly an idyllic spot. Accessed via a pillared gated driveway with ample parking and turning space on a tarmacadamed driveway that leads to the property, the garages and onto the main garden areas. A great location, stunning views and a spacious 3 bedroomed residential smallholding. A must see. The property is listed under the Local Authority of Carmarthenshire County Council and has the following charges. Council Tax Band: 'C'. 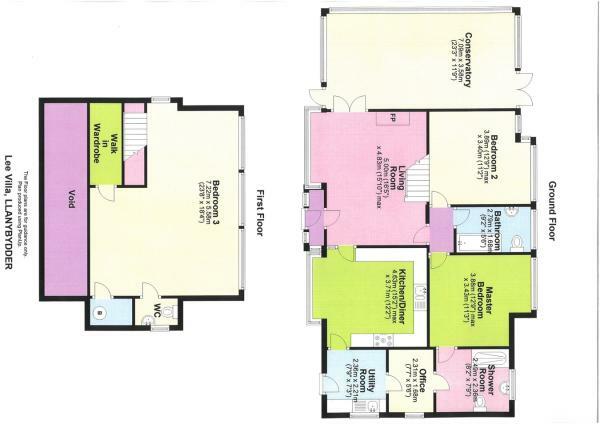 Disclaimer - Property reference 12481641. The information displayed about this property comprises a property advertisement. Rightmove.co.uk makes no warranty as to the accuracy or completeness of the advertisement or any linked or associated information, and Rightmove has no control over the content. This property advertisement does not constitute property particulars. The information is provided and maintained by Morgan & Davies, Lampeter. Please contact the selling agent or developer directly to obtain any information which may be available under the terms of The Energy Performance of Buildings (Certificates and Inspections) (England and Wales) Regulations 2007 or the Home Report if in relation to a residential property in Scotland.